Is there a better place to be on a sunny, spring afternoon, than a baseball park? Doubtful. Before baseball stadiums were named after their huge corporate sponsors they were named after their owners—independent businessmen who invested in baseball for the love of the game. 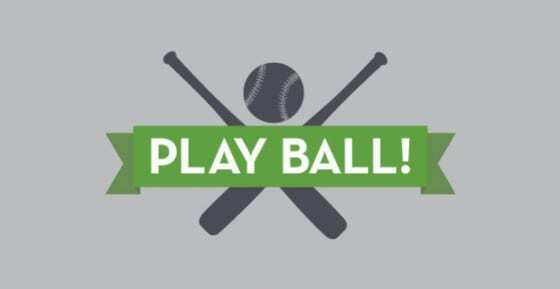 Now you’ll find big stadiums with big names: Citi, Chase, AT&T, Minute Maid… even Petco Park! These monster parks have jumbotrons, fancy dugouts and luxury suites. But the classic, old baseball parks will always represent the history of the great American sport. Home of the Brooklyn Dodgers from 1913 to 1957, Ebbets Field was built on the site of a garbage dump. Owner Charlie Ebbets had big plans, including an 80-foot rotunda with a chandelier and imported Italian marble floors, but somehow forgot to add a press box. One was added later, in 1929. 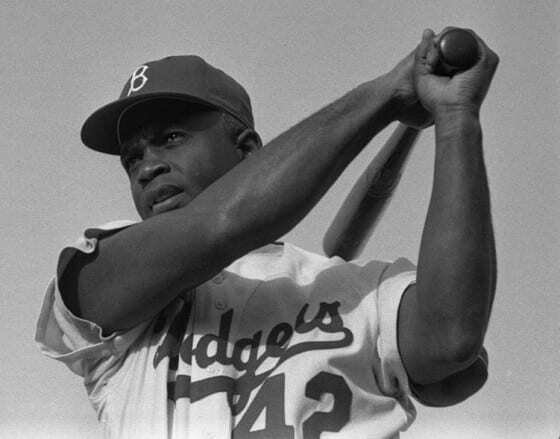 Ebbets Field and the Dodgers made history several times over: Branch Rickey signed Jackie Robinson as first baseman in 1947, making him the first African American to play Major League Baseball. Robinson’s first game was at Ebbets Field on April 15, 1947, with 26,623 fans in attendance for the historic game. The Brooklyn Dodgers won pennants 7 times: in 1941, 1947, 1949, 1952, 1953, 1955 and 1956. They won the World Series in 1955. Unfortunately, though the park kept adding patron seating, it maxed out at a capacity of 31,902 seats. There was little parking, and by the mid-1950s, then-owner Walter O’Malley started looking for a site to build a new park. A dispute with the New York City Building Commissioner finally led O’Malley to take the Dodgers to L.A., where they went at the conclusion of the 1957 season. Ebbets field was torn down in 1960. Because of its contribution to the history of baseball, it become a legend, even though apartments now stand in its place. 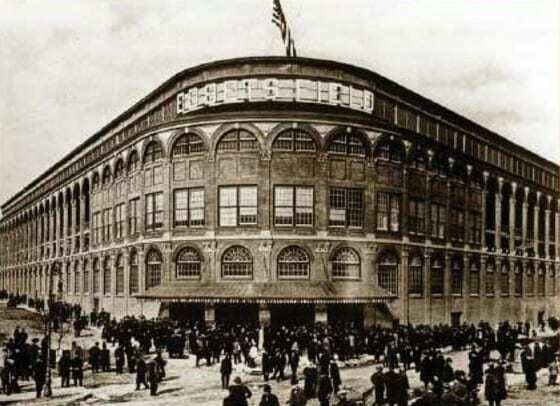 Citi Field, home of the New York Mets, was built with a similar facade as Ebbets. It also has a similar rotunda, which is named for Jackie Robinson. 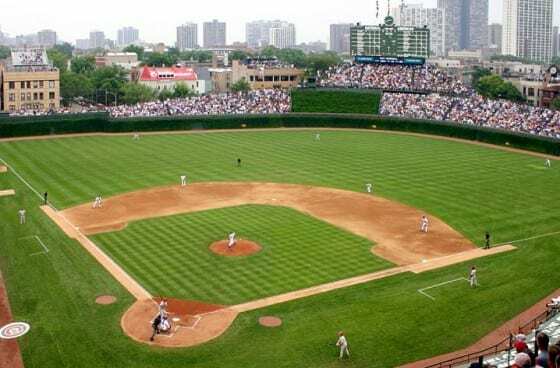 Originally known as Weegham Park, Wrigley Field is the home of the Chicago Cubs. The park has been almost completely rebuilt, but it’s considered the oldest National League park and is the second-oldest major league park still in use. Ernie Banks nicknamed the field The Friendly Confines, a moniker it still proudly carries. The original park was built in 1914 on land that had previously been owned by a seminary. Charles Weegham, a local business owner, became part-owner in the franchise and moved the team from DePaul University to his new park on the corner of Clark and Addison. The Chicago ChiFeds (later renamed the Chicago Whales) played in the Federal League for two seasons before the league went bankrupt. Weegham was not deterred by the loss of the Federal League. He bought the Cubs for a half million dollars and moved them to Weegham park for the 1916 season. Over the next two years, Charlie Weegham sold many of his shares to a new investor, William Wrigley, owner of the chewing gum company. 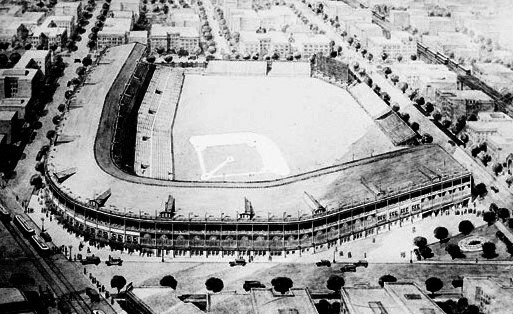 Wrigley took total control of the Cubs in 1921, and began to think about expanding the ballpark. 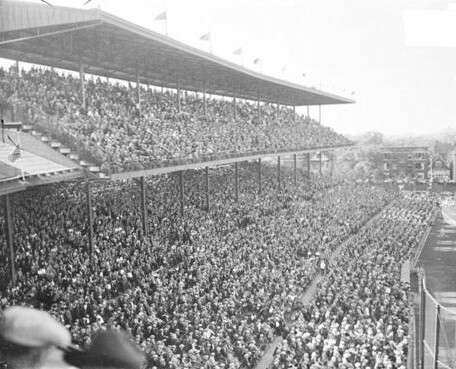 In 1922, major renovations began, almost doubling the number of fan seats to 31,000. The newly-renovated park opened for the 1923 season, but the number of fans quickly outgrew even the enlarged park. In 1927, a double-deck was added to the grandstand, and the baseball park was renamed Wrigley Field. During the 1927 season, 1.1 million fans attended games, breaking National League records. In 1928, over 1.5 million fans attended. 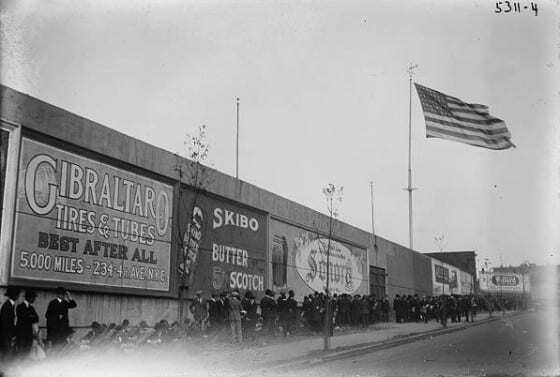 Temporary wooden bleachers were erected for the 1929 World Series, which increased the number of seats to 50,000. The marquee over the park entrance was installed in 1934. The original was blue, and featured removable letters that were changed for each game. In 1982, the marquee was replaced with a digital board and was changed to red. Courtesy Scott R Anselmo, WikiCommons. In 1937, permanent bleachers were built and the famous manual scoreboard was installed on the centerfield wall. 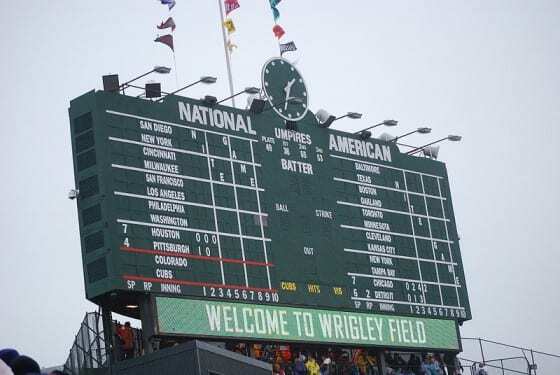 No baseball has ever hit the scoreboard, which is now a protected monument. A longtime Wrigley Field tradition of flying a white flag with a blue “W” when the Cubs win, or a blue flag with a white “L” when the Cubs lose began the first year and still continues. The scoreboard has been one of the few in major league baseball without blatant advertising. Beer ads were briefly placed on the scoreboard in the 1980s, but didn’t last long. In 2007, Under Armour placed a small ad on the board. New Signage for Wrigley Field? There’s a current proposal for new signage to be installed around the exterior of the park, and it has Wrigley’s neighbors up in arms. Bleachers on the rooftops of the buildings surrounding the field have allowed patrons to buy cheaper seats to see the game for years, albeit from a distance. Building owners make a profit, and give 17 percent of that profit to the park, as a result of the settlement from a 2002 lawsuit by the Chicago Cubs. It’s estimated that the Cubs receive around $2 million per year from its portion of rooftop bleacher ticket sales. The Ricketts family, current owners of the Cubs franchise, want to renovate Wrigley. In addition to contributing $300 million of their own funds, the family wants to make additional revenue by placing new signage around the park. The rooftop bleacher owners say that signage would infringe on their 2002 settlement agreement. The proposal includes 41,000 square feet of new advertising space. Some of the planned signage will block the view of the field from surrounding rooftops. In addition, much of it will be illuminated, which also makes neighbors (who don’t welcome the intrusion of late-night lighting), angry. The Ricketts family says it’s happy to work with the neighbors and take public comments. Many of the building owners have offered to have rooftop signage installed, which they say will generate up to $20 million per year, but Tom Ricketts dismissed their offer. Renovation plans also include a 6,000 square foot Jumbotron scoreboard, which is estimated to bring in $20 million in advertising revenue all on its own. The original scoreboard will remain in place on the centerfield wall. As of today, the issue hasn’t been resolved. 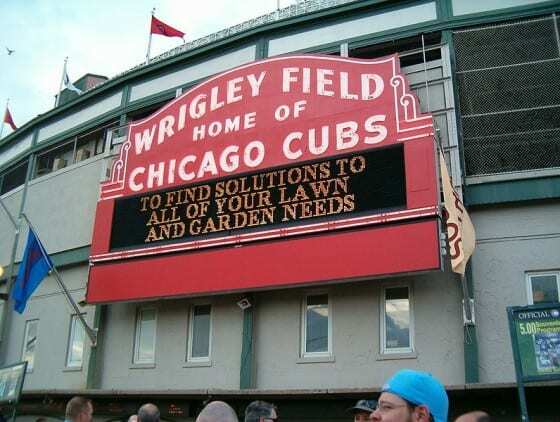 Tom Ricketts has threatened to move the Cubs to another city if his signage plans aren’t approved. What do you think about the proposed renovation to Wrigley Field?